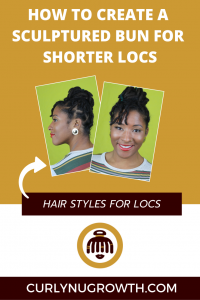 If you’re looking for a chic style that you can do with medium (shoulder length) length locs, look no further! This Sculptured Bun hairstyle is really simple to create as long as you have a hair net. 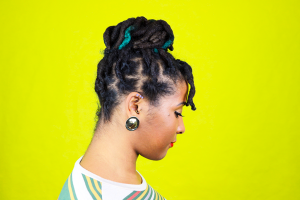 Yes, you read that right— a hair net is the simple hack to create a sculptured bun with shorter length locs! Creating this Full Sculptured Bun will take about 20 minutes— start to finish— you will just need to be sure that you have all the supplies ahead of time. Also, another bonus tip for you when you’re styling your hair, make sure that you can see the back of your head. I know this may sound simple, but having this type of setup will make the styling process go a lot quicker because you will be intentional with the placement of the hair pins. 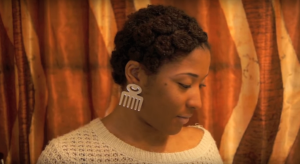 As you will see in the tutorial video, you do not have to create the Full Sculptured Bun hairstyle on recently retwisted hair, in fact my twistout is about a week out. 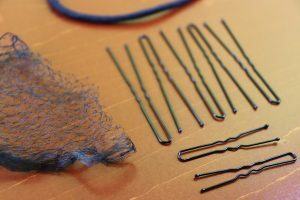 The first thing that you will need are the supplies— a hair net, hair pins, and a hair tie. I normally get my hair nets from Sally’s Beauty Supply, but you can also find them on Amazon. After you have gathered all the supplies, this is where the magic happens! Use the hair tie to create a high ponytail and then fan the hair around the hair tie. This will form the foundation of the Sculptured Bun. 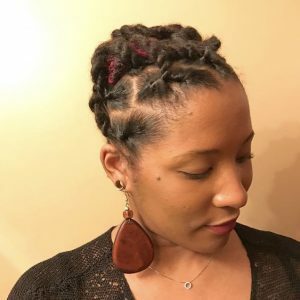 I must admit, this step was really easy for me in the video tutorial because my hair was crinkly (from a twist out) and so it was easy to manipulate and pin down. 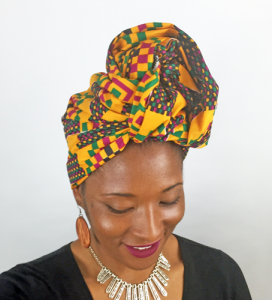 But once you have a good amount of locs pinned down(as you see in the video I didn’t pin all of them) you want to use the hair net to control and subdue any stray locs. Voliá! Let me know in the comments if you try this style! 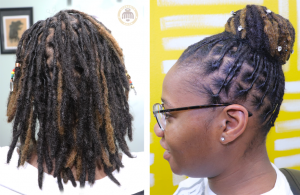 Good morning Happy 2019, as always you have given me some great ideas for my locs, I just cut my locs in a shoulder length bob style which I m enjoying, those pin up styles are cute and easy. Happy New Year Donna! I am so glad that this tutorial inspired your styling! Definitely let me know if there are any other styles that you are interested in!